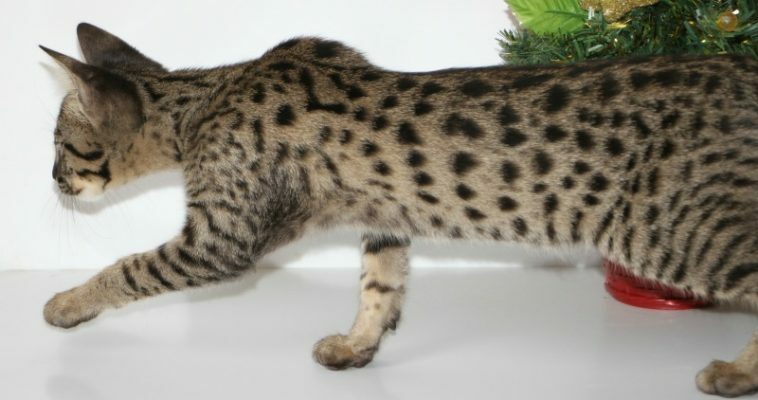 Home / Why are Savannah Cats expensive? Many people ask what makes Savannah Cats Expensive. The answer is multifaceted and this article will take a stab at trying to explain them all. First, if someone wants to begin to breed Savannah cats, there is the expense of purchasing at least two cats. A male and a female. This person chooses to begin with the F1 generation. A serval male will cost approximately $5000. An accompanying female, F3 or F4 will cost between $3000 to $5000. If we take an average of $4000 and add it to the serval cost of $5000 that is $9000 to start. Most new breeders will begin with two or three females. Next, housing for the serval is a consideration soon after the purchase. A whole (unneutered) male, will begin to spray. Some breeders choose an addition or remodel a garage. Then there are those who build an outbuilding. Any of the choices can range from $2000 to $10,000. We will take the mid-line choice of $6000 for this discussion. So far that is a total of $15,000. $9000 for cats and $6000 for housing. Another Consideration is the cost to feed the cats until they even produce a kitten. A growing serval will eat about 2 pounds of raw meat each day. Servals usually eat chicken thighs and breast meat. Chicken prices vary from state to state. For the sake of this article, we will say that chicken is $2 per pound. That is a cost of $4 per day to feed a serval. That does not include the additives that a serval must have mixed in the chicken to stay healthy. $4 per day for one year is $1460. Take into consideration that a serval may not begin to breed until 2-3 years old. That can be as much as $4380 before our breeder sees a kitten. We will use half of that amount to be considerate $2190. Add serval food @ $2190 to our total above of $15000 and that comes to $17190. Now we talk about raising one female until the breeding age of 1 year. Savannah breeders typically feed a good-quality, grain-free kibble (dry food) and a grain-free canned food. If this female eats one cup of kibble and one can of food each day they following are the calculations. We averaged Instinct, Taste of the Wild and Solid Gold kibble and the daily cost is $2.53. We also averaged Pride, Earthborn and Weruva canned and the daily cost for one cat averages $2.05. Daily cost to feed one Savannah cat is $4.58. This is $1671.70 for a year. Add that $1671.70 to our previous running total of $17190 and we have $18861.70. Also relevant, is that the prices we used do not include sales tax and they are from a discount site, not the premium cat stores. Are Savannah Cats Expensive yet? We have not yet talked about Veterinary visits, immunizations, PK Def testing for parents, PCR testing for parents and kittens. Also Fed Ex fees for sending time-sensitive testing. Litter and other supplies like water bowls, litter boxes, scoops, beds and scratching posts. Both servals and growing cats need toys and activities to keep them busy. We are not done yet. Paying for website construction, the prices vary. There are yearly hosting fees for the site and renewal of the URL. The International Cat Association charges to register a cattery and yearly membership fees. Besides, each cat and litter has a registration fee. The list goes on and we haven’t even touched on how little a breeder makes per hour when there is a kitten to sell. If a breeder worked only one hour per day (which is never the case) and paid himself $5 for that hour, that adds up to $1825. Few people would work for those wages. Finally, we can consider that a serval may never consider a Savannah as a mate. So all the expense raising a serval may be for nothing. The responsible breeder will have the lifetime of caring for that serval. Many breeders breed simply breed for the love of the cats. Others choose to never get a serval and yet the costs can be the same or higher. Buying a good looking and fertile male is very similar. A breeder will have spent a huge amount of money just to start breeding and the feeding and care cost is ongoing. Finally, some Savannah cats are more expensive because they meet the Savannah Cat Standard better than other cats. That is why there is a range on our pricing chart.